The Great Rift Valley of Africa ends in Zambia’s spectacular Luangwa Valley. One of the continent’s highest concentrations of wildlife thrives on the floodplains of the slowly meandering Luangwa River. 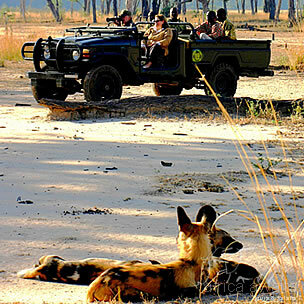 SHENTON SAFARIS’ camps are located deep within the South Luangwa National Park, in the very best game viewing area. The areas around KAINGO CAMP and MWAMBA BUSH CAMP are exceptionally rich in wildlife, in particular the big cats. Derek Shenton, a third generation conservationist, built Kaingo Camp in 1992, and later created Mwamba Bush Camp. He continues to run the camps with his wife, Jules. Shenton Safaris’ two camps, Kaingo and Mwamba, are the epitome of eco-friendly luxury and are designed to transport you into the heart of the African bush, without a single distraction. The camps are solar-powered ensuring that nothing competes with the sound of a lion’s roar, a leopard’s call or the early morning ‘drumming’ of Ground Hornbills. "One week with Shenton Safaris was a thorough immersion in the very best of South Luangwa. Expert guiding from Derek Shenton and his team brought us memorable encounters with the valley’s most impressive wildlife, both on foot and on wheels, whilst the laid back ambience of the two gloriously situated camps makes them hard places to leave. The photographic hides were a revelation, a rare opportunity to sit tight and let unsuspecting wildlife come to you - plus the thrill of meeting a hundred hippos eyeball to eyeball. And all this without another camp or vehicle in sight. Magical!" - Mike Unwin, BBC Wildlife Writer of the year and author of the Bradt Guide to Southern African Wildlife. Shenton Safaris’ PHOTOGRAPHIC HIDES (or blinds) are world-renowned. BBC, Discovery Channel, National Geographic, independent filmmakers and famous wildlife photographers, including Andy Rouse and Frans Lanting, have all used these hides - and returned. six beautifully appointed chalets, each with en-suite bathroom, are nestled under ebony trees on the bank of the Luangwa River. They command uninterrupted views of the river and its wildlife. 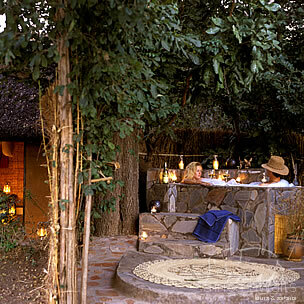 In addition, four of the chalets have their own luxurious, outdoor bathtubs. has three stunning reed and thatch chalets, which refl ect a thoughtful balance between back-to-nature simplicity, essential comforts and African style. Each chalet includes soaring skylights and an en-suite bathroom open to the stars. Kaingo and Mwamba Camps actively support anti-poaching efforts within the National Park and Derek Shenton is on the Board of Trustees of the South Luangwa Conservation Society. Kaingo and Mwamba Camps also support local schools, village development projects and has recently adopted the Hanada Orphanage. Zambia is a vast country, friendly and peaceful, that offers superb wildlife, remote game areas and memorable cultural encounters. Landlocked in central Africa, it has a remarkably low population in a deceptively massive country means that this is still Africa undiscovered with a timeless sense of wilderness and remoteness. 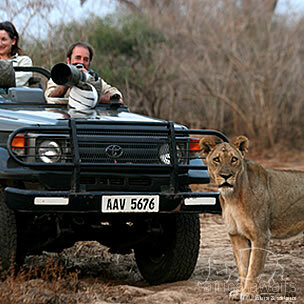 With your holiday, safari or business trip from in to Kaingo Camp in Zambia.